There’s a large grocery store chain back in the Mitten that when I was growing up, sold their own generic brand of products that they would sell alongside the name-brand stuff. It wasn’t so very different from the name brand, and you could get just about anything. And believe me, we certainly did (it being the cheaper option and all). One of the things I remember that my mom would get for us from this grocery store’s line of products were these cookie/crackers that the chain sold in the snack aisle. They came in an orange bag and were marketed as butter-flavored animal shaped cookies. But since, they were on the thin side, I always thought of them as crackers. They were SO delicious. For whatever reason that still irritates me to this day, the product was discontinued. I haven’t seen it in years and there’s not even a trace of them left on the internet (which is how you KNOW they’re not coming back anytime soon). Nothing I’ve seen sold in stores since has ever replicated them in appearance or taste. Isn’t that just the worst? Sometimes I wonder where the recipe for those crackers is now; shoved away somewhere at the bottom of a drawer in some corporate office, never to see the light of day again. And who was the genius who made the call to stop selling them in the first place? I want the name of their supervisor so I can write in a strongly worded complaint. Such a waste. I mentioned before in my last few posts that I’d started in on a kind of cracker-making spree. When my first attempt turned out great, I started experimenting with a bunch of other recipes that I knew I would eventually get around to sharing on the blog. It doesn’t happen very often, but sometimes I’ll make something that I end up liking SO much, that I almost immediately want to make it again–just to have plenty of it. Sometimes, I don’t even want to share it. I just want it all to myself. I tried this recipe on a whim. I had all the ingredients on hand, plus I made some additions/modifications of my own that I thought would make it taste a bit better, but I wasn’t expecting anything *huge* to come from it. So, imagine my surprise when I tasted one and was immediately transported back to my childhood, reminded of the delicious butter cookies/crackers in the orange bag from the supermarket’s generic knock-off line. Are they 100% the same? No. They’re (if I may say so myself), actually an improvement. Te vanilla in the dough gives them a wonderful aroma as they’re baking. The cinnamon and nutmeg is noticeable, but not overpowering. Besides the flavor, the texture of these is what I love best about it; it’s a tender crumb that still has that perfect amount of snap that gives it the ‘cracker’ feel. Then, the coarse sugar topping gives it a pleasant crunch to compliment the cracker itself. I was SO impressed/thrilled/greedy with how these turned out that as soon as the first batch of these were done cooling, I was already washing out my dishes and getting all the ingredients back together again to make another. This is a very easy and forgiving dough; I just stuck with regular squares, but I think they will hold just about ANY shape, so if you have cookie cutters and want to make these with kids, I’d say anything will go & work. I’m sure that that recipe for the discontinued butter cookie/crackers is out there somewhere; but I think that this one is a very easy and delicious substitute. So take that, processed food corporate execs. Linking this post up to Fiesta Friday #169, co-hosted this week by Jhuls @ The Not So Creative Cook and Elaine @ Foodbod. In the bowl of a standing mixer, (or using a handheld one) cream together the butter and sugar with the dry powdered milk, cinnamon, nutmeg, salt, baking soda. It doesn’t have to be light and fluffy, just combined. With the mixer still running, drizzle in the vanilla. Add the egg white little by little alternately with the flour until dough just comes together. Don’t overmix. Gather together into a ball, shape into a disc and wrap in plastic wrap. Place in the freezer for about an hour. Preheat oven to 350 degrees. Dust a clean work surface with flour. Line 2 baking sheets with parchment paper and set aside. Roll the dough to about 1/8 inch thickness. Run a metal spatula underneath the dough as you roll and turn it out to make sure it doesn’t stick, sprinkling with additional flour if necessary. Use a cookie cutter or bench scraper to cut out the dough into crackers. Place the crackers on the baking sheets and freeze for about 20 minutes. Using the tines of a fork, evenly prick holes through the dough. In a small bowl, combine the coarse sugar, brown sugar, a dash of cinnamon and the 1/8 teaspoon of vanilla extract. Lightly sprinkle this on top of the crackers. Bake for 12-13 minutes until just beginning to brown at the edges. Remove to wire racks to cool completely. Yum! I want these with some soft cheese! I think they’d be wonderful with some soft cream cheese; thank you! These sound so good that my feelings towards cinnamon might change. 😀 Thanks for sharing at this week’s FF party! Oh, I hope so Jhuls. I love cinnamon, and look for ways to put it in everything, savory & sweet lol Thank you! Another great cracker recipe! 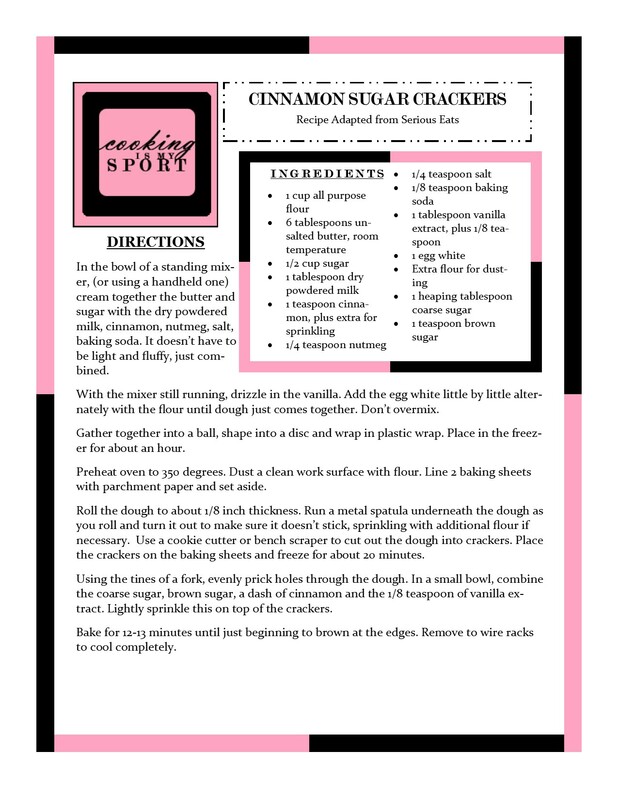 I love cinnamon sugar anything and these crackers look so tasty and crispy – yum!